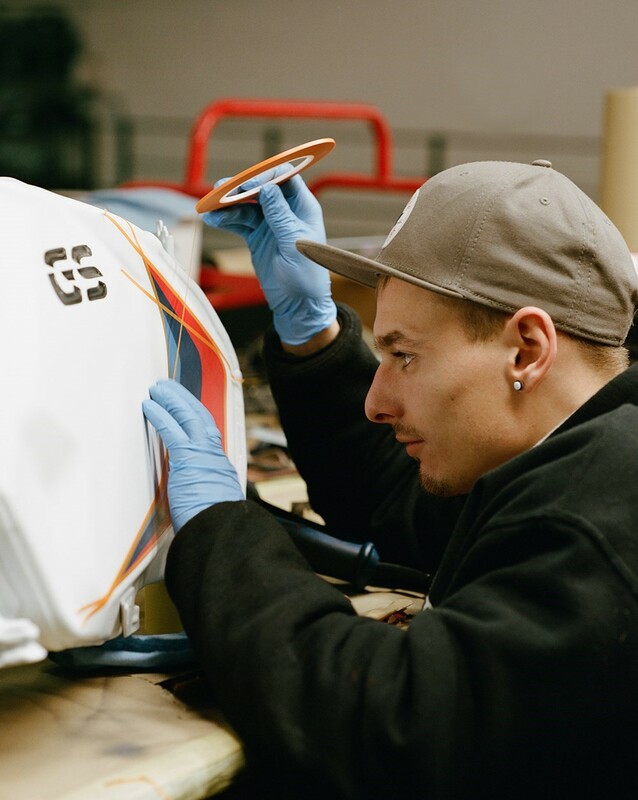 "Very often a motorbike is an expression of who someone is; an extension of themselves, much more so than a car," says bespoke paintwork specialist Joe Black. And he should know, having been entrusted with the customisation of an impressive array of very special bikes over his 19-year-long career – including those of Tom Cruise and Rod Stewart, as well as numerous limited edition runs for Harley-Davidson, Triumph and BMW, and a mesmerising one-of-a-kind Triumph Street Twin, complete with cosmic paintwork and psychedelic logo, for the new issue of Another Man. Black's love of drawing and appreciation for paintwork and murals began as a schoolboy in Lancashire, but it wasn't until adulthood, while working as a panel beater, repairing crash-damaged cars, that he found himself returning to his childhood passion. "Nowadays a panel beater doesn't do the repair work, but in the old days we did everything and I became quite good at colour matching. With motorcycles, the colours are very elaborate and hard to formulate because from the manufacturer's point of view, having a bike that looks really great and unique in the showroom helps to sell it, but there's not much consideration for the repairability of colours." 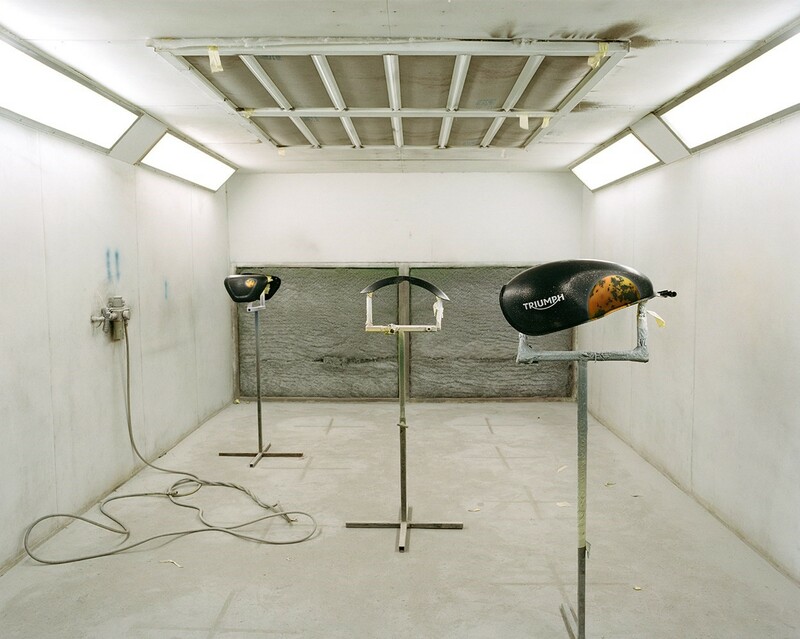 Having honed his skills working on cars, and seeing a niche in the motorcycle market, Black decided to "knock on a few dealership doors" to see if they had any bike panels they'd like repairing, and before long had had to set up a small workshop in the garage at the side of his house to cater for the influx of business. Shortly afterwards he got a call from his local Harley-Davidson dealer asking if he'd be able to create an Evil Knievel replica. It turns out that he could, and with extreme skill, and thereafter "the custom stuff really took off" and Black relocated to a farm, where he converted a barn into a studio to take on more commissions. Today, Black can be found in a vast, whitewashed workshop in a business park in Ripley, surrounded by his team of 12 employees, diligently conjuring up the exceptional designs for which the company, dubbed 8 Ball, has become renowned. The process of creating a custom paint job can range from a few hours to several days, depending on the scale of the commission, Black tells us, and begins with a good long chinwag. "A lot of clients really do treat their bikes like children, so of course whichever member of the team is doing the artwork will sit down with them to work out what they want, and steer them in the right direction if they're not sure." Unsurprisingly, Black has encountered a diverse selection of requests over the years, from elaborate memorials through a painted history of the armed forces. But what's been his most unusual? "We did a bike for a lovely lady who wanted the designwork to represent people who had died – family members and so on. She wanted us to paint keys and locking doors, with someone who had passed shown in a room behind each door. When she came to collect the bike, she was over the moon with it, and then to top it off there was a massive white feather on the back tyre. I was really surprised because a feather is the last thing you'd expect to find in the workshop, and then she explained that if you see a white feather it means somebody in the afterlife is watching you. I don't know if it's true but it sent a shiver down my spine!" For the Another Man S/S16 bike and its intergalactic tank and side panels, Black applied silver paint flicked onto the black background with a paint brush to created a speckled star effect, applying an orange candy paint to realise the mesmerising marble planets ("that was a new trick I learnt from this piece!"). Whether it's a large-scale commercial project or a one-off personal piece, Black and his team believe passionately in taking on commissions that they feel inspired by "because if you do something you don’t like, your heart’s not in it and they don’t get the best out of you." 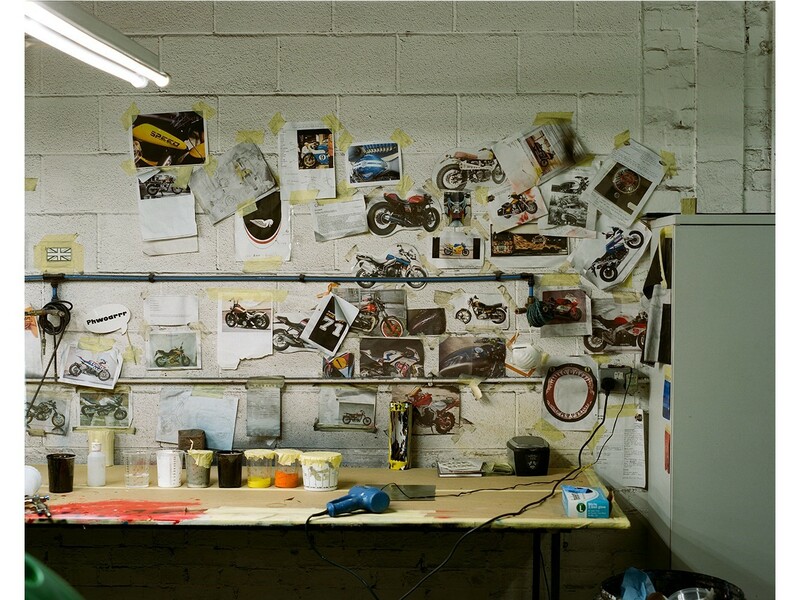 And it's certainly proving a winning formula – the 8 Ball workshop is currently filled with 200 BMWs for a top-secret collaboration, while stories of his many satisfied customers, told with a joyful and unboasting enthusiasm, abound. "We did two bikes for a couple over in Cheshire somewhere and the husband had been coming to see me for around six to eight months to go over ideas – so a really long time. Eventually, we did the job and drove them over to his house in a big Stanley display truck. When I got there I fired all the lights up, I put some music on and he came out. He was really quiet and I thought, I know they’re beautiful but it’s obviously not what he was expecting because he’s not showing any emotion. Then he walked back into the house and I began to feel really worried. When he came out, he was wearing dark glasses and he started taking photographs. Finally he said, 'Joe, that’s stunning. I've been panicking about it for the last two weeks, about whether I’m gonna love it, hate it, or have no feelings at all for it, but it's beautiful.' Turns out he’d put his sunglasses on because he’d been crying; a really big burly chap. That makes it all worth it." See the Another Man S/S16 Triumph Street Twin motorcycle in full in the new issue of Another Man.